So it’s not secret by now that I find subjects like this very interesting, apart from EVP’s and videos of bizarre interferences I find any electronic signals to be interesting, such as numbers stations for example. I realise that one of the ones I had not raised here was the concept of being called beyond the grave. Is the telephone a way to make a last goodbye? To give a deceased person a change to make one last communication before moving on? Quite extensive research has been made, Phone Calls From the Dead (1979) by D Scott Rogo and Raymond Bayless, was the result of their two year research into the matter. In 2012 another book by Callum E Cooper also picked up the subject. The types of calls appear to fall into three main categories and one is where the witness receives a call from someone who died, sometimes not that recently but either way for the most part the witness knows that the caller is dead and it is rare that they are not aware of it when the call comes in. Another variation is that the witness gets a call from the deceased but discover their death afterwards. Often it seems to come from the phone of a relative or friend and they did not call, but for an unknown reason had thought about calling them, the voice is unusually strong compared to the faded static type. Some witnesses said it was odd because that person sounded quite mechanical or possibly even drunk. A rarer but report case is also noted of people calling to the deceased, not intentionally, to find that the conversation they’d had should not have been possible. The person that answered was dead or perhaps the person they should have been talking too was not even in that place at the time. One of the most famous incidents of this type is by Charles E Peck’s calls on 12th September 2008. At 4:22pm a commuter train with 225 people on board collided with a freight train in San Fernando’s Valley, California, and the 49 year old Charles Peck was on board. 25 people died, 135 were injured and of the injured they sent 87 to hospital, 46 were in a critical condition. Peck had been travelling for a job in another area, he could then plan his wedding to his second wife once they were closer together, Andrea Kalz was his fiancée and from his prior marriage he had three fully grown children. Andrea heard about the crash on the radio whilst heading to the station to collect him. Peck;s parents and siblings already lived in the area and they came to join her whilst they waited for news. In the first eleven hours of the wait there were calls from his cellphone suggesting that he was alive. Calls were made to his son, brother, stepmother, sister and fiancée. In all there were 35 calls and they would answer to hear static, understandably they would call back but the call then went to voicemail. The calls meant that the crews were prompted to use his signal to aid in the search, they looked again into the location and at 12 hours after the crash they found him. Peck was deceased, declared dead on the scene and the resulting investigations showed he had died on impact. Long past his death his cell phone had carried on reaching out to loved ones. Unfortunately they were unable to retrieve the phone or there is no evidence that it was found. Interestingly enough in regards to the Peck case, it seems that Snopes have decided that there was enough evidence to class this as true. The island is known for the most part as Hy-Brasil and was first put on a map in 1325; it was made by the Genoese cartographer Angellino de Dalorto. He placed it to the southwest of Ireland and was described as almost perfectly round with a river down the centre. It has been noted locally before that but this is it’s first documented appearance. The Celtic people put this to be an island of eternal plenty and happiness, it was populated by an advanced civilization and they possessed the best technology and wealth. The island had towers and streets of gold, and it was shrouded in fog, it was only witnessed by the general population once every seven years and if you tried to approach the island you would never be able to fully reach it. Of course there are supposed to be the rare people that did and they came back richer than their wildest dreams. The race seemed to be on to get to Hy-Brasil and claim it to make themselves richer than anyone else! 1480 saw explorer John Jay Jr depart from Bristol, England to try and find it but came back empty handed. 1481 two shops from Bristol called Trinity and George went out and again seemed unable to find it. Several other attempts were made, it remains speculation about their success as there was nothing further noted. 1480-1497 the Italian explorer, John Cabot, made an excursion to find North America but had an ulterior motive to try and locate Hy-Brasil, he was convinced it was out there and it’s not certain if he found it or not. After the 1497 voyage a letter from the Spanish diplomat, Pedro de Ayala, claimed that Cabot had found land that has been discovered by Bristol men in the past, or at the very least he had seen it. The speculation on that one could anything at all from he found it, to he decided to bunk off using it as a reason. In 1674 Captain John Nesbitt made the biggest claim, saying he had set foot on the island and explored it. He said they had been sailing when a dense fog enveloped the ship and when they landed they were at an unfamiliar shore. They found that it was inhabited by large black rabbits, and there was a wizard there in a stone castle. They returned loaded with gold and silver given to them by the islanders and then Alexendar Johnson followed up his claims saying that Nesbitt was correct with his information. 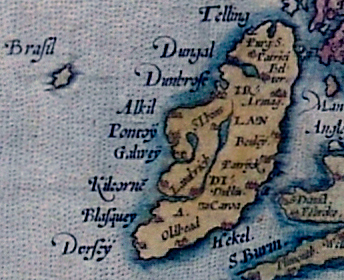 It seems that despite the hardships of confirming the islands existence it remained on the maps anyways, but the position of it appears to shift and two maps in 1595 show it lying west of Ireland. In all of the maps it was still round with a central river, and then it helps popping up until 1870 when the British Admiralty removed it. This didn’t stop stories about encounters though and in 1878 the people of Ballycotton in County Cork were amazed to see an island appear where it hadn’t been before. 18th February 2012, pilot Niger Gosseur reported a mysterious bank of god along the ocean on the west coast of Ireland, in otherwise clear conditions. He reported that his compass went haywire and that he saw landmasses where he was sure there was none before. Baffled he continued to fly over to Ireland. One of the ideas put forward is that the island may well have existed at some point and has been buried under the waves. The evidence for this might be the west coast of Ireland has a place known as Porcupine Bank,a raised seabed found in 1862, this for some suggests it is perhaps evidence that an island once existed there. Another theory is that many have mistaken the nearby Baffin Island as the island of Hy-Brasil, this is off the northern coast of Canada. The location of the island has slowly crawled around and changed so it’s possible that it was misidentified and has slowly been corrected over time. Another explanation is that the island has never existed; it could be an optical illusion. One type of mirage that can account for this is the Fata Morgana, a layer of warm air which sits on a layer of cold, it then acts like a refracting disc and can created inverted images from distant areas and coastlines. Perhaps they are seeing this? Whatever the history/story it’s brilliant idea for a story… and the imagination of many has been captured about the idea of the disappearing island that comes up to grant you lots of cash! So whilst I am not an avid sports fan it seems fair that I cover these, as they no doubt come under interesting even frightening if you were there for them. So lets go with the round-up. ( I am avoiding Hillsborough if you are wondering, this is simply too big to cover and would no doubt require me to go into a major history account.) I haven’t chosen to link videos, if you want to go and find out more do so but I will say they are very harrowing, you are watching people in the process of dying on some of them. Whilst I am pretty much of the stance that I will take a neutral view, even I admit these are damned sad to watch. 23rd June 1968 – Puerta 12 tragedy, Buenos Aires. This is less well-known it seems but 71 fans died at the stadium, it was two sides that seemed to blame one another for the terrible events. Calls about people burning flags seemed to have caused a stamped and the fans rushed towards gate 12; it caused the deaths and around 150 injuries. Victims were between 13 and 20 years of age and in the end the league paid compensation to the victims families. Even today the area remains to have changed little with the low light around the area, the stairwell and the gate are virtually unchanged. 2nd January 1971, Ibrox Stadium in Glasgow, Scotland. A stampede led to the death of 66 people and over 200 people being injured. Until the 1989 Hillsborough Disaster it was the worst to have occurred in the United Kingdom. The stadium’s owners were later found to be at fault over one of the deaths, they did not dispute it and 60 other cases were brought forwards. In 1902 there had been a previous incident there, a stand collapsed due to heavy rain the night before and killed 25, and injured 517. In 1971 more than 80,000 fans attended and Celtic took a 1-0 lead against the Rangers. Some Rangers supporters began to leave but at the final moments an equaliser was scored. Thousands were leaving and as this was happening, by stairway 13, a child was on his father’s shoulders and fell, it caused a terrible chain-reaction. Most of the deaths were caused by compressive asphyxia (chest compressed until the longs cannot take in enough air and the person suffocates). Bodies had stacked up to six feet in some of the areas and these days there is a memorial to the event and those who lost their lives. 20th October 1982, Luzhniki in Moscow, Soviet Russia (it was the named Grand Sports Arena of the Central Lenin Stadium) a stampede started that killed 66 RC Spartak Moscow fans and the number of those that died was not made official until 1989, until then speculation ranged from 3 to 240 deaths. The fans had two of the four stands open, they could get the area cleared of snow that way and most of the fans went to the East Stand as it was closer to the Metro station. Thee were about 100 Dutch supporters. The game itself was pretty much uneventful and the fans began to head out minutes before the end, presumably they had already seen enough of the match. The fans effectively rushed to the Metro Station side exit. A fan fell at the lower steps of stairway one and, according to some reports, it was a woman that had lost her shoe and stopped to find it, some stopped to help. The crowd was getting dense by this stage and a domino effect started. 1st February 2012, Port Said Stadium, Port Said City, Egypt... a riot occurred at the stadium with 72 killed and over 500 injured when thousands of El Masty spectators stormed the stadium stands and pitch, following a 3-1 by their team. They attacked El Ahly fans who were in their own area using weaponry and fireworks. Their anti-government/revolutionary chants had many thousands of Egyptian fans thinking that it was a set up to get rid of the revolutionary group. The Egyptian government responded by shutting down the domestic league for two years. The match had been delayed for 30 minutes as El Masry fans were already on the pitch, and each time there was a goal they invaded, along with the half time invasion. The El Ahly were trying to escape and being attacked as they ran, they were asking for police to protect them as they ran and in the melee there were people thrown from the stands as well. The Egyptian family airlifted in soldiers to rescue the players who had been stranded and the Al Ahly coach a the time, Manuel José, even considered giving up coaching, as well as leaving Egypt for good. The security forces were condemned that they had hesitated to act and part of the support for the idea it was government organised came from the lack of security searches, that eyewitnesses saw security standing aside during the attack and overall it seems that this was part of the evidence that was being waded through. On 26th January 2013 they held the trial, 21 accused were effectively handed their death sentences with 52 postponed until March 2013. 27th January 2013 it was reported that the Egyptian government had lost control of the city. Sadly the deaths continued there. Other mentions are the Estadio Nacional disaster, Lima in 1964 where a Peru and Argentina match took place and with Argentina leading 1-0 and six minutes of normal time left, the fans of Peru were angered by a goal being disallowed that would have meant they were equalised. The result was a pitch invasion and tear gas being deployed, steel shutters were closed and panic ensued crushing people. All those who died were in the stairwell and there were at least 328 deaths, though this may be an understatement. The Accra Sports Stadium Disaster in 2001 also deserves a mention, taking the lives of 127 people in Africa. Trouble had been anticipated and there was extra security but the match carried on and bottles and plastic seats were thrown on to the pitch. The police fired tear gas into the crowd and panic ensued with a crush off 127 people that lost their lives. Ghanaian fans remember the disaster on the 9th May each year. After speaking with my more football savvy friend, he also mentioned that as disasters go another really should be mentioned. The Bradford Stadium fire. On Saturday 11th May, 1985 fire broke out. It was a tragic event taking the lives of 56 supporters and injuring 265. Police, supporters and staff were forced from the stadium dragging out people they could, trying to save as many as possible as the stand was engulfed in fire. This event is one that sparked a wave of new legislations for safety, the antiquated stadium had been unfit for purpose. Bradford City still support the Burns Unit at Bradford Royal Infirmary as their chosen charity to this date. And my final one is the Estadio Nacional Mateo Flores, 16th October 1996, just before the 1998 FIFA World Cup Qualification match was about to take place, saw 83 people killed and more than 140 injured as excessive numbers of fans then tried to break into the General Sur section. It created a human avalanche and it seems that the excess was most likely down to counterfeit tickets and the poor design of the building. It was a terrible situation with many people having suffocated in the mass. The sad part is that many of these tragedies are due to bad planning or poor layouts, not to mention people. It’s also unfortunate that the majority of the people in all the cases above would likely have been nothing more than people wanting to enjoy a day out supporting their sport. Violence, stampedes or general disasters meant that innocent people died in a terrible way and I think we owe it to them to remember these things and try to learn from them each time. Or the Dybbuk Box, is basically a wine cabinet that was sold on ebay and some believe it is haunted by a dybbuk. They are usually restless spirits that are able to haunt and possess the living. It is also the inspiration for the film The Possession (2012). I became more aware of the story when it was covered on the Mysterious Universe Podcast, they went into detail about it. Kevin Mannis listed the wine cabinet on Ebay and the item description included a paranormal story about events he linked to the item. It is worth noting that Mannis is by trade a writer and creative professional and at the time was involved in the antiques business at Portland, Oregon. The story he provided was that the box was brought during an estate sale in 2003, A Polish Holocaust survivor named Havela had escaped to Spain and then purchased the box there before immigrating to the United States. Havela’s granddaughter provided the information and he said that as it was a family heirloom he would happily hand it back. She said that they did not want it, it had always been in her grandmother’s sewing room and had not been opened as a dybbuk lived inside. Mannis opened the box and found two 1920’s pennies, a lock of blond hair bound in a chord, a lock of black/brown hair with a chord, a small statue with the Hebrew word ‘Shalom’ on it, a small golden wine goblet, a dried rose bud and a single candle holder with four octopus shaped feet. He said that since owning it he suffered horrific nightmares, and that anyone staying at his place experienced the same thing. He gave the box to his mother has a birthday present and she suffered a stroke the same day it was handed to her. The claims are that owners or those staying near the box suffer nightmares, and that many report the smell of cat urine, jasmine flowers or nightmares of an old hag. Iosif Neitkza was a student at Kirksville, Missouri and the last person to have auctioned it on Ebay. He said that the box caused lights to burn out at the house and his hair to fall out. When it was ready to be sold the Director of the Museum of Osteopathic Medicine stepped forward to offer to buy it and Neitzke sold it to him. Haxton wrote The Dibbuk Box, and claimed that since he had taken hold of it he had developed strange health problems that included hives, coughing up blood and ‘head to toe’ welts. He said that he also spoke to Rabbi’s to find a way to seal the dybbuk back into the box. This was successful and he states he has now hidden it away in a secret location, that he does not intend to reveal. Skeptic Chris French states that he think it’s down to the owners being primed about the purchase and relating it to bad things. If they believe it has caused them to be cursed then it would play out that way, anything bad would be related to the box and not to something unfortunate happening, with or without its presence. So it sounds like quite a tale, but here’s the thing, the entity is supposed to possess people not objects and talks from the victims mouth not from a wooden box, the soul of the dybbuk clings to the soul of the person it is possessing. However again that’s folklore so who is to say that this one didn’t decide the box was a better offering? What is worth noting – it’s not been handled by “lots of people”, more a small number, Kevin Mannis who owned it, said he got it off someone that had it in the family. Mannis gave it to his mother, it was returned and then tried to give it to his sister and brother. Having had it returned he then sold it and the new owner returned it, “This has a bad darkness”. Mannis then sold it on Ebay and the owner became Neitzke, he then relisted it 8 months later having created a blog and talking about it. However there seems to be no blog to refer too about this now. He doubled his money on the sale for the old wine box and it went to Jason Haxton. So in total there have been three full owners, three Mannis family members and one person that handed it back quickly to the antiques store. Given that no one can find Nietzke and that all of them have promoted the thing to sell it, resulting in a film which gave no credit to them, it seems that there are more questions about it than answers. And now that it cannot be located it is, lets offer the sceptical point here, no way to investigate the validity of this crummy old wine box anyway. I remain sceptical on this one due to the lack of actual evidence about some of the people involved and that seemingly the end result of this is Haxton’s book, a story for profit. The WOW! Signal was detected in 1977, 15th August by Jerrty R Ehman whilst working on a project at the Big Ear Radio Telescope. It was in Ohio, it bore the expected anticipated markings of being extra-terrestrial. The noise lasted for 72 seconds and since then it has not been heard again. The name WOW! came from Ehman writing it on the computer print out of the signal. There have been further attempts to detect the sound again, but by 1999 after six 14-hour long observation attempts WOW! had not been picked up again. In 2012, on it’s 35th Anniversary a response from humanity was beamed out. The idea is that if there are other lifeforms out there, they might pick us up on their travels.